Follow your storytelling instincts everywhere they take you. With no additional housing, KeyMission 360 is waterproof down to 30 meters*, freezeproof down to -10°C and shockproof up to a drop of 2 meters. Create immersive 360° videos of a child's first bike or sled ride, a skiing or snowboarding run, cannonballs in the pool, fun at the beach, snorkeling and diving adventures—any experience you want to relive and share. *With included Underwater Lens Protector attached; angle of view becomes narrower. You'll want to share every amazing 360° video and photo, so KeyMission 360. Videos from the camera can be viewed, edited and shared with a compatible smartphone and the SnapBridge 360/170 app. The app connects with your KeyMission 360, giving you the power to set up the camera, shoot remotely, change settings and automatically transfer and share photos, all from a compatible smartphone. The camera is in initial pairing standby mode at the time of purchase (pairing refers to the setting used to connect the camera and smartphone or tablet through Bluetooth). To shoot without pairing, turn on the airplane mode switch on the camera. If you turn off the airplane mode switch, the camera will return to initial pairing standby mode. Since KeyMission 360 doesn’t have a monitor, the dedicated app “SnapBridge 360/170” is required to set up this camera, use remote photography, play back images, change settings, and more. Before setting up the camera, install the dedicated app on your smartphone or tablet. Wireless communication is not available when the camera is underwater. Compact and lightweight, KeyMission 360 can be mounted just about anywhere. It includes a standard 6.35 mm socket for attaching to existing accessories, and Nikon offers more than 10 versatile mounting accessories: adhesive and suction mounts, helmet and wrist straps, a chest harness, KeyMission extension arm, handy grip and more. Find unique angles for every mission. 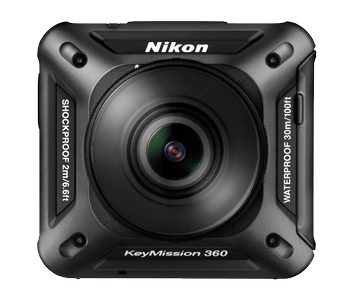 Nikon's KeyMission 360/170 Utility allows you to edit your videos on a compatible PC or Mac. Trim your videos and make them look the way you want so people can relive the excitement, then share them on social platforms that play 360 degree videos. All measurements are performed in conformity with Camera and Imaging Products Association (CIPA) standards or guidelines. 1. Battery life does not reflect the use of SnapBridge 360/170 and may vary with the conditions of use, including temperature, the interval between shots, and the length of time that menus and images are displayed.2. When the lens protectors or underwater lens protectors are not attached and when the underwater lens protectors are attached.3. When the lens protectors or underwater lens protectors are attached.4. Dropped from a height of 200 cm. (6 ft. 6 in.) onto a surface of 5 cm. (2 in.) thick plywood (changes in appearance, such as paint peeling off and deformation of the drop shock portion and waterproof performance are not subject to the test).These tests do not guarantee that the camera will be free from damage or trouble under all conditions.